Ananda Washington is Comprised of Six Separate Organizations and Has Members Throughout the Region and State. During this time the fledgling Ananda meditation group in Seattle was visited by Ananda teachers from the original and (still) largest intentional community near Nevada City, CA: Ananda World Brotherhood Village. Classes and musical programs were offered at various locations around Seattle. Its members organized retreats up to Orcas Island, and would go on retreat to Ananda Village in California at least annually, especially to the popular event there known as Spiritual Renewal Week (offered in mid-August each year). 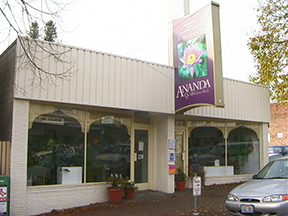 In 1983, the predecessor non-profit organization to Ananda Seattle was officially formed. From here until 1986, regular visits by Ananda teachers continued and the work grew steadily. Then, in 1986, the local leaders asked Swami Kriyananda if there was an Ananda teacher available to move to Seattle to teach full-time. Swamiji responded by sending not just one, but four minister-teachers! And so, the organization was re-constituted as Ananda Seattle and, in time, became recognized by the I.R.S. as a church and non-profit (“501(c)(3)”) organization. East West Bookshop, too, has had four locations, all within one block of Roosevelt and 65th! Now located above Whole Foods and next to Bartells in the Roosevelt Square Shopping Center, East West serves as an active and tangible expression of Ananda’s commitment to interfaith principles. To its day-to-day customers, Ananda’s visibility is almost opaque, though for those resonant with Ananda, they will tend to notice our book and product display or be attracted to one of the classes or events we offer that are held at the store. East West has also employed our founding members and leaders over the years. The store serves as a training and testing ground for making our ideals practical: for learning to work together in harmony, while serving our customers and vendors in a new paradigm of cooperative living “at work.” Visit the store or check us out at www.EastWestBookshop.com. In 1992 their hopes and efforts bore the fruit of the purchase of a 32-unit apartment complex adjacent to Lynnwood and near the northern intersection of Interstates 5 and 405: an ideal location on 5 ½ acres of tree-filled, park-like land! Owned by members, whether resident or nonresident, and leased to Ananda, Ananda Community of Lynnwood hosts many events throughout the year. One, most notable, is the popular Summer Solstice Open House. This features other local intentional communities and has fair-like booths from Ananda enterprises and others from around the Sound. With the seed of a generous donation in the year 2000, we were eventually able to build the meditation temple and move our center to Bothell. We still conduct classes and Sunday meditations in Seattle at the East West Bookshop. Now, recently, we’ve completed the development of the site with the opening of the Institute of Living Yoga’s Yoga Hall! Here we can also hold our festive holiday banquets even as the hall is used daily for yoga and other classes. 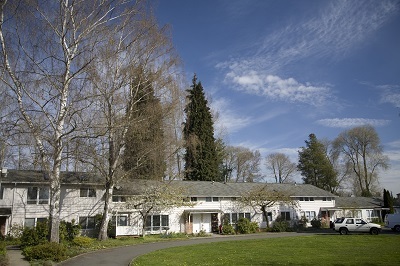 During the years since 2000, Ananda members, in cooperation with the spiritual directors of Ananda Washington (Nayaswamis Hriman and Padma McGilloway), have started a Living Wisdom School in Lynnwood and a supporting thrift store nearby called Living Wisely Thrift & Gift, and Ananda Farms Camano Island. We have six locations in all to host the joyfully thriving “community” of Ananda devotees and friends serving the public. On other pages of the website we explain aspects of membership and organization that you might find interesting. (See the Welcome menu above.) Visit the national site, www.Ananda.org, for information and inspiration of many kinds. Ananda has growing communities throughout India, in Europe (near Assisi, Italy) and in Mexico www.AnandaEspanol.org and South America. There are meditation groups throughout these countries and many others as well. Thank you for your interest in Ananda.